An inflammation of the protective outer lining of the brain and spinal cord is called meningitis. The majority of cases are brought about by viruses or bacteria, although it can be associated with types of illness or medications. 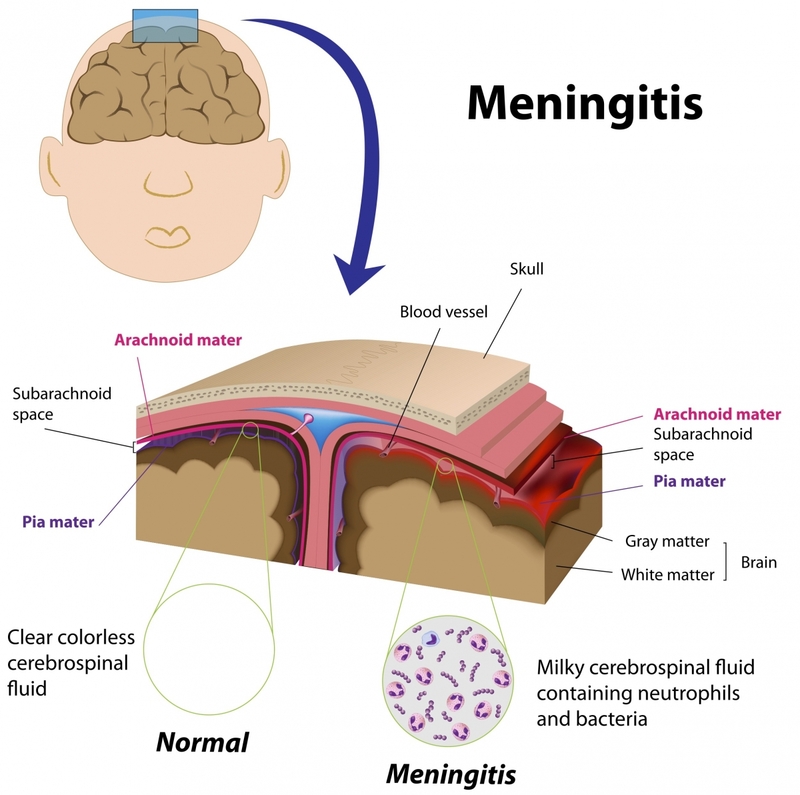 Meningitis caused by a bacterial infection is rare. Bacterial infections are serious and could cause life-threatening side effects if not treated with antibiotics. Viral meningitis is more common and far less serious compared to bacteria meningitis. The infection is often difficult to diagnose because symptoms are similar to the common flu. Both viruses and bacteria associated with meningitis are found in the human body every day; often related to other routine diseases. Viruses and bacteria that usually affect the respiratory tract, gastrointestinal tract, urinary system and skin may spread through the blood to the meninges. Cerebrospinal fluid circulates around the spinal cord. In a number of bacterial cases, the bacteria spreads to the meninges as the result of a severe local infection such as a nasal sinus infection or a severe ear infection. Head trauma can also open the pathway for meningitis. While viral cases are the most common, it is rarely a serious infection. Viral cases of meningitis may be caused by a number of viruses, including those spread by mosquitoes. Meningitis is not always easy to recognize. In a lot of cases, the illness progresses without any symptoms at all. During the initial phase, symptoms are often similar to flu symptoms. Individuals suffering from Meningitis however, could become seriously ill within a span of a few hours, so it is essential to recognize other symptoms of the condition. These include headache, fever, muscle pain, nausea, vomiting and cold hands and feet. Infants may exhibit different symptoms, including blotchy skin, pale skin, jerky movements and high-pitched moaning cry. Due to the fact that meningitis symptoms are commonly associated with other disease, doctors may not diagnose the condition on the first visit. If the symptoms persist, a spinal tap is the only means of diagnosis. A spinal tap involves removing a small amount of cerebrospinal fluid for testing. There is no treatment for viral meningitis. Patients must rest, sometimes in the hospital, until symptoms disappear. Bacterial meningitis can be treated with antibiotics. Medications must be administered through IV so a prolonged hospital stay may be advised until the condition is treated.